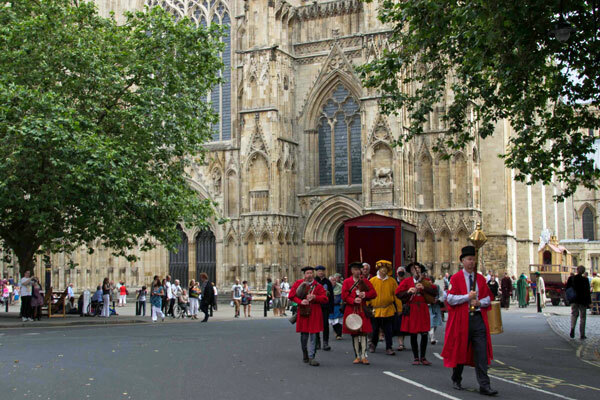 "The Plays are a physical manifestation and an intellectual manifestation of our culture and heritage, in the streets or in the Minster, and by York’s communities; volunteering and participation being an absolute bedrock of our culture." "The notion of a community owning a narrative tool is the key to the strength of the Mystery Plays." "The profound dualism of the Mystery Plays; the struggle between good and evil is played out... That’s at the heart of the dynamic of the Plays, and I think that’s entirely relevant to people who are living in hard times and in a world where we are struggling with war." Mariana Lopez’ project researches the soundscapes of the actual locations in York where the plays were originally performed. She looks at the acoustics and sounds of the city where the waggons stopped and their effect on how audiences heard and reacted to them. The research also covers some of the newer locations where waggon plays are now being performed. The website has links to recordings of people talking about their experience of performing on waggons in both old and new locations and, by contrast, in the static – or staged – productions and of the effect of the many sounds of the city surrounding the plays in performance. Do you want to become a member of our community? Do you want to keep in touch with the YMPST? Would you like to support the Supporters Trust?